On Halloween of 2008, Steven Holl Architects unanimously won the international design competition titled The LM Project for their design connecting two civic and business buildings with a public walkway 65 feet above the harbor in Copenhagen, Denmark. This monumental design is reported to be profitable, elegant, civic-minded, and ecological, all wrapped into two piers connected by an angular bridge. It looks like Holl’s obsession with porosity is moving toward a delicate handshake. Meanwhile, Copenhagen will gain what was sought: an iconic landmark and new urban spaces on the tips of the Langelinie and Marmormolen Piers. 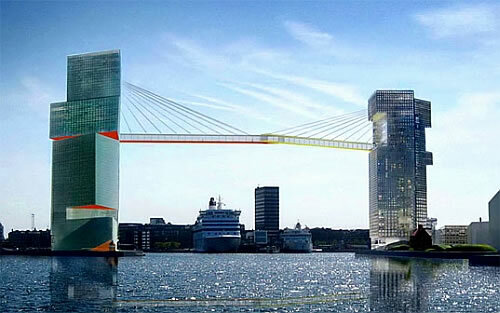 This entry was posted on March 22, 2009 at 10:16 pm and is filed under Architecture, Bridge, Copenhagen, Public Space. You can follow any responses to this entry through the RSS 2.0 feed. You can leave a response, or trackback from your own site.